There are many reasons why you may decide to put your business aircraft or private jets up for sale. But regardless of your motivation, when you partner with the Holstein Aviation team, 300 years of combined experience representing more than 4,700 separate transactions valued in excess of 10 billion dollars goes to work for you. Along with this team comes some of the most innovative and creative marketing programs and processes in the business aviation industry, or any other for that matter. The process starts before we even meet. It begins with absolute dedication by the company founders, senior management and every employee to the singular principal of adding value to your endeavors. It also starts with listening intently and in-depth. Then we go to work. With you. And for you. While we never stop listening, we also now start sharing. Sharing market information and forecasts. Pricing histories. Aircraft specifications. Comparable sales data. Individual product analysis. Cash flow projections. Contractual documents. Pre-buy inspection status and findings. Market updates. In short, everything and anything you need to know so that you can make the best - and most informed - decision. Data and information can be lost in voice mail boxes, or become buried in the sea of daily incoming email. But these concerns are now things of the past. Every detail on every aspect of your transaction or project is in one place throughout the entire process - and then remains there for as long as you wish. When you need our professional services for buying and selling new or used planes, Call us. We'll be ready. Missions and requirements change. Companies merge. Divisions are acquired or sold. Sponsors depart. Financial resources get redeployed. Technological or competitive developments necessitate new approaches to the way you do business. While the end result is the same (you put your jet plane up for sale), our approach to marketing your aviation asset incorporates the reasons for it becoming available. Pricing is fine tuned. Market positioning revised. Asset preparation scope is altered to accommodate specific sale time frames and revenue projections. In short, your requirements and rationale drive our strategies and tactics. However, selling your business aircraft outright may not be the best decision. It could be that a different aircraft with different capabilities and operating costs might be the optimum solution. Accessing the many benefits of business aviation in a different format, ownership type or utilization scenario may be more sensible. Perhaps shared ownership, like kind exchanges, sale and leaseback, or short term leasing can meet your overall needs. Regardless of what provides the best result, it's incumbent upon the Holstein Aviation team, as your partner, to identify all viable and relevant alternatives for you. Transactions are what generate revenue for our company, but a long term business relationship with you and your organization creates the real value. No matter the course of action selected, we'll do everything in our power to make sure everything is in your best interest. Many things affect the aircraft sales price, often causing wide variations among even the same make and model. For example: cabin layout, the avionics suite, type of engine, support program, interior and exterior condition, damage history, domicile, mission types, previous owners, and even the paint scheme and color. When it comes to evaluating the worth and the value, which can be two very different figures, the truth is the truth in the business aviation marketplace. By partnering with Holstein Aviation, you quickly learn the market realities for your aircraft and what final outcome to realistically expect. The business aviation market is fluid, to say the least. Many factors continually and constantly affect aircraft pricing and availability: demand and supply, availability and cost of financing, and operational restrictions or requirements, for example. Most certainly the United States and global economies play major roles. But these aren't things on which you need to spend a lot of time. That's our job, along with also knowing the state of the market for each category and every current model of business aircraft in the fleet. And we do - intimately. The average industry tenure for Holstein Aviation team members is three decades, with the longest being 40 years. That's a lot of knowledge and experience all in one place. And it's all available to you. Global contacts at flight departments, financial institutions, insurance providers, aircraft manufacturers, and in corporate board rooms as well as executive suites, culled weekly, daily or even hourly when necessary provide insights and updates. State-of-the-art information sources are utilized for the latest updates to establish and verify trends, sales histories and forecasts. Finally, more than two centuries of combined experience and the vast knowledge resident within Holstein Aviation will prove invaluable to you. At the end of the day, a business aviation aircraft, new or used, is worth exactly the amount for which it will sell. With the information provided by, and the sale process guidance from, your Holstein Aviation team of professionals, you won't leave money on the table or spend more in asset preparation than necessary. 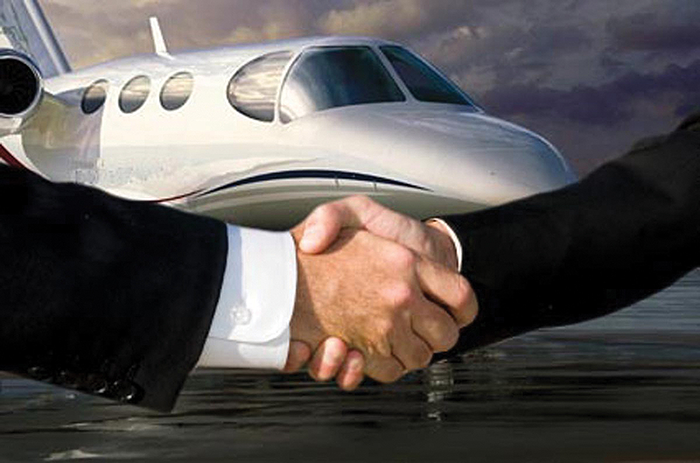 You obtain the maximum possible sale price in the shortest possible time for your aircraft. Best of all, you leave all the details to us. The residential real estate industry knows the value of good "curb appeal". Likewise, there are specific and proven ways to prepare your business aircraft so that it presents at its best. Whether remedial, cosmetic or required, we know what work you need to do, and when and where you need to do it. The relatively simple and minor act of deep cleaning and detailing may be all that is needed to bring a selling price that is thousands of dollars more. Perhaps engine, avionics, interior or performance upgrades, or specialized maintenance work might be required. Or maybe something in between is what will make your asset move in a reasonable, even expedited, time frame. Depend on Holstein Aviation to make sure you only do what is necessary. No more. No less. There are many maintenance and upgrade resources, some professional and some pretenders. You don't need to learn which is which the hard and expensive way. Your Holstein Aviation team guides you to who you need, when you need them, and what you need to pay. Which pays off for you. As always, we guide, direct, manage and supervise every aspect, every step of the way. With this professional and experienced oversight, you never need to worry that you are being shortsighted. Or shortchanged. The actual transaction should be anticlimactic. Signing paperwork and transferring funds are routine and uneventful tasks because your Holstein Aviation team has done the headwork and legwork. Guided you carefully through the process every step of the way. Negotiated the sale and managed all the details, from asset preparation to loose equipment reconciliation and support program transfers. Now all that is left for you to do is cash the check! If you partnered with the team at Holstein Aviation to acquire your aircraft initially, chances are good you also used us to identify, qualify and recruit flight, maintenance and support personnel. Should the sale of an aviation asset remove the requirement for these individuals, our expert Marketing and Human Resources professionals will work with your employees to develop quality resumes, cover letters and networking skills. The same level of knowledge, experience and expertise available to help you with a business jet, private jet or turboprop purchase or sale also exists to help your former flight crews, maintenance technicians and administrative staff move on to their next opportunity. Quickly. Intelligently. And with dignity. This is where most say goodbye. But not your Holstein Aviation team. We now begin an ongoing process to keep you abreast of the business aircraft market, make you aware of unique opportunities, and help you continuously plan for the future. Needs change. Demand can return. There may be a requirement for short term lift. Or more capable lift than you previously possessed. But when your situation changes, the Holstein Aviation team of professionals never picks up with you again where we left off. Because we never leave.